Hello, BFWP folks! My friend Lael asked me to have a look at your website, and you now have an Antarctic reader and follower. Best of luck with everything! Question #1 (from The Big Sister): Why are you in Antarctica? Are you on vacation or working? "I came (to Antarctica) for many reasons. I needed a bit of a break from the acting world as I hadn't had one in quite awhile, and I wanted to travel. However, I am also trying to save up money to buy a place in Chicago, and I couldn't spend it all traveling. So, I found the perfect solution when I found a way to work and see new things all at the same time. I'm saving money, since I was able to sublet my apartment and food and lodging is taken care of here. So the answer is: I'm vacationing AND working." 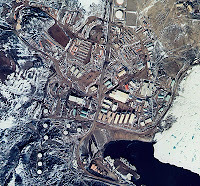 Question #2 (from The Dad): Who all is there at McMurdo Station? "During the Summer season (mid-October thru mid-February), there are about 1200 people here at McMurdo Station, and many of them are scientists and researchers who are primarily studying this place and how to preserve it. They come in and out, usually for short lengths of time. The rest of us are here to support them and the work they are doing, and that means everything from IT guys to make their computers run well, to the janitors and cooks to clean and cook for them. We have plumbers, electricians, carpenters, etc, all so that this place (and the field camps) can run as smoothly as possible. During the winter (the rest of the year), there are less than 200 of us. Then there is only one scientist here, and his job is to make sure all the research still going on here is working right (i.e., making sure computers are running and data doesn't look skewed). The rest of us (plumbers, IT, admin, etc) continue our summer jobs and continue building and rebuilding this place so that when the scientists and the masses come back, it's all ready for them. My job during the summer was a Shuttle Driver. I drove the largest vehicles on the continent, back and forth to the airfield, bringing people to and from, and it was awesome! Since the airfield shuts down at Winter (no people or fresh food or mail coming in), there are no driver positions, so I got an administrative job supporting FEMC (Facilities, Electricians, Maintenance, and Carpentry) crew, the largest of the Winter divisions with 70+." Question #3: Did you like the job you did on McMurdo? Could you do that same job back home? "I loved driving the big vehicles and carting people back and forth between town and the airfield. It was just fun meeting new people and getting to see the mountains and the beautiful sky every day. I also really enjoyed my winter job of doing administrative work, and I wouldn't have wanted one of the outside jobs over winter. I suppose I could do similar jobs back home -- I've done admininstrative work in Chicago, and I've also driven trolleys, but it's different driving on snow and ice." Watch a video, made by Marika of a ride into McMurdo in a Delta. Want a job on Antarctica? Click here for more. *Please note: we came up with the title and giggled a bit about it (you may recall we really have fun coming up with titles!) To us a girlfriend is a woman who is there for you, who listens and answers questions -no matter how silly- and most importantly is inspiring. Marika certainly meets the 'girlfriend' criteria! I think you need to hear from Uncle Brian next. He's traveled more miles on a bike than anyone I know! Thanks for sharing Marika's trek! What a great way to learn geography, world travel, culture etc! "Rock" is Auntie Margie signing in from work...not sure why this is happening...!! But it's me, Auntie M!